A magnitude 7.8 earthquake struck Nepal early on Saturday 25 April, devastating the capital region of Kathmandu. Reports suggest that more than 6,600 people have died and communities and businesses have been destroyed. This is the worst earthquake to hit the area in 81 years. 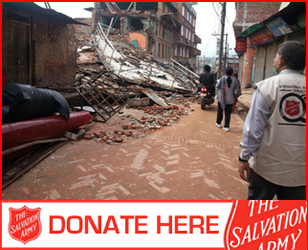 The Salvation Army has been at work in Nepal since 2009 and is responding to the urgent needs - currently the provision of shelter and clean water. But we need your help.